1. 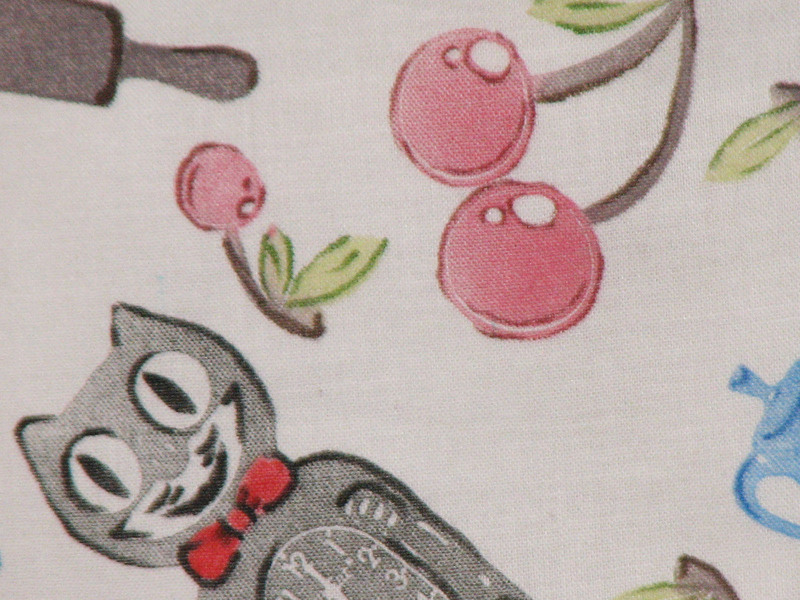 Purchase a plain apron or if you’d like to sew an apron purchase 1 yard white or cream cotton fabric. 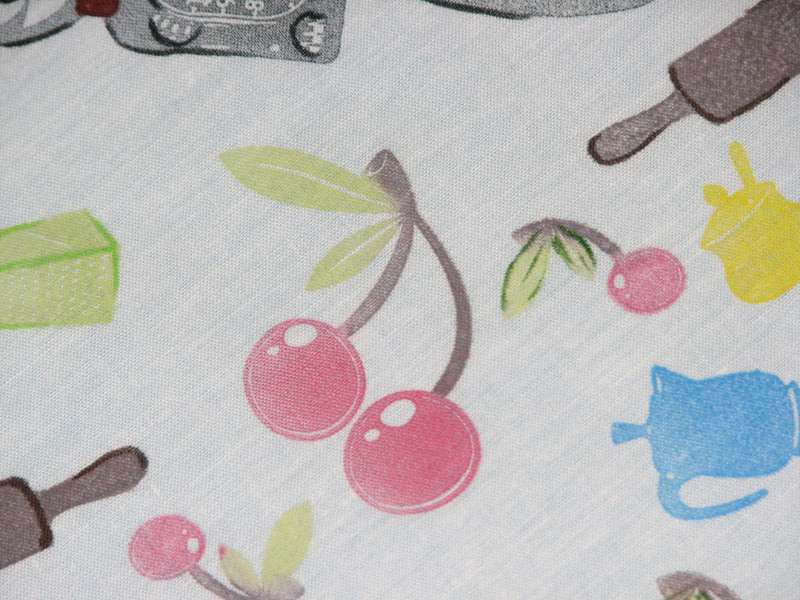 Pre-wash the fabric or finished apron prior to stamping. 2. 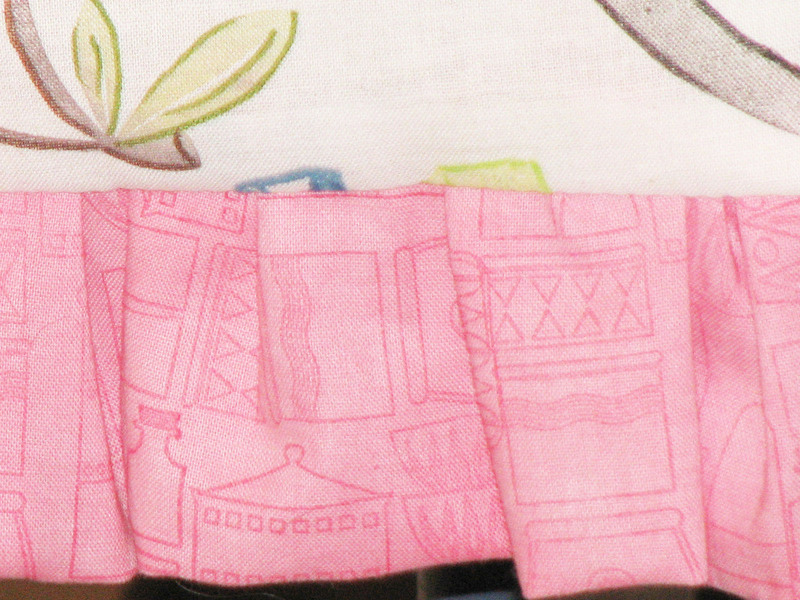 If you are sewing the apron, cut the various pieces from the fabric. I drew a basic apron shape onto a piece of paper and used it to cut out the body of the apron; cut the left over fabric into (3) 5″ strips for the ruffle and (2) 3″ strips for the tie. 3. 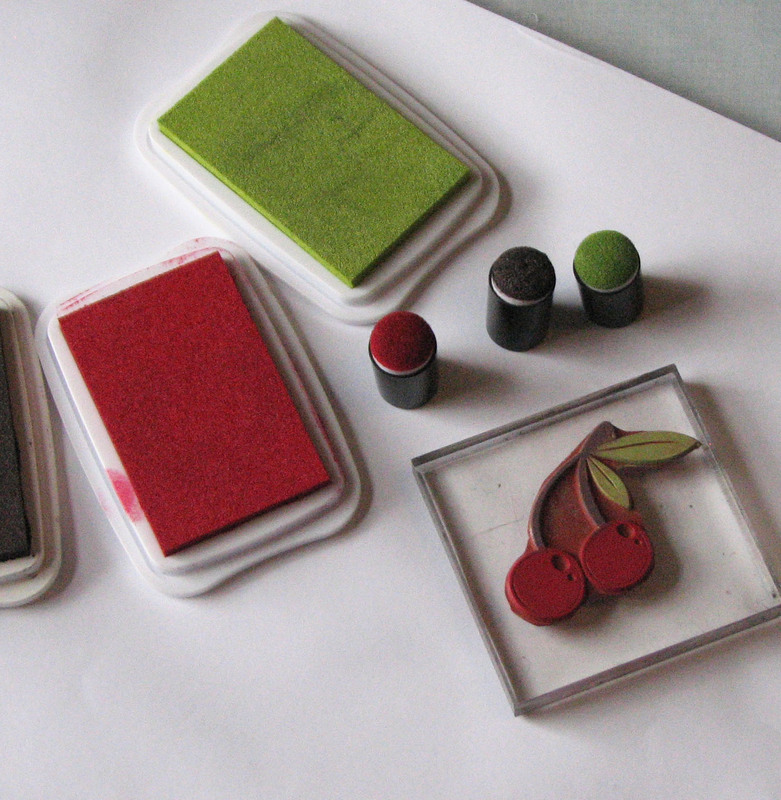 Use Sponge Daubers to ink a stamp requiring multiple colors. Pear Tart, Love Letter and Rich Cocoa were used for the cherries. 4. 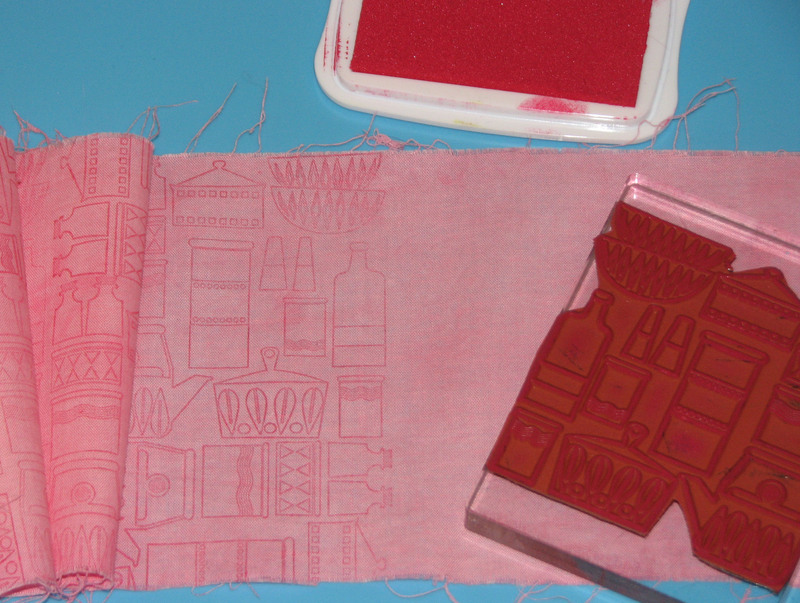 Firmly press the inked stamp onto the fabric; for best image, re-ink the stamp each time. 5. 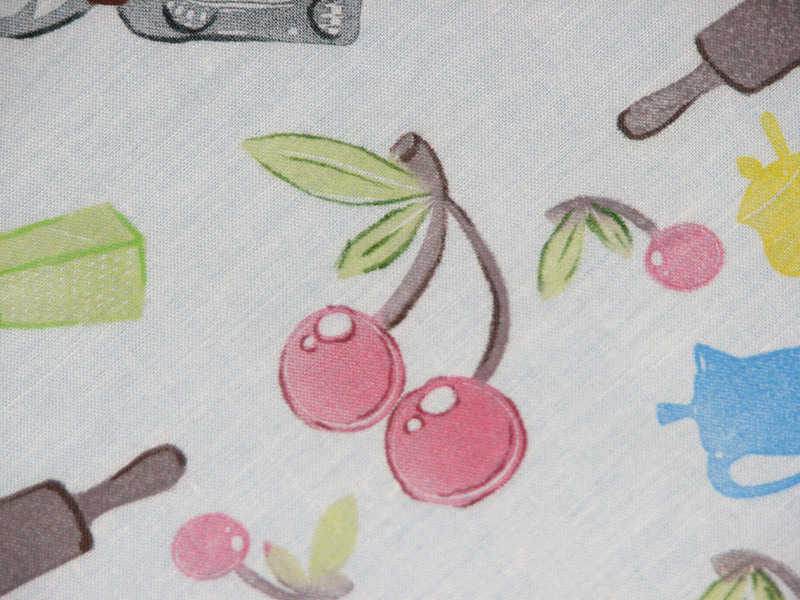 Iron the fabric after all of the cherries have been stamped. 7. Add depth and define the images by adding outlines to various areas of each image using Fabrico Markers. It takes your images from this to this. 8. 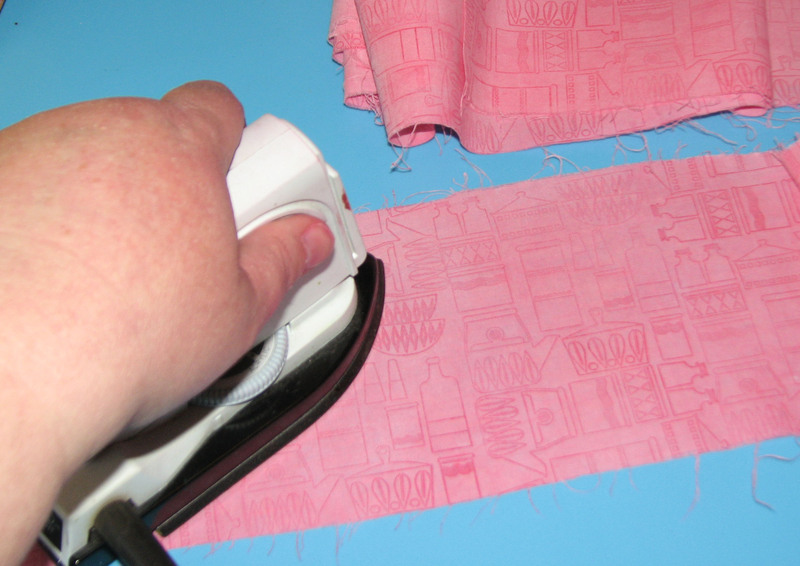 Iron the fabric after you have added the pen work. 9. 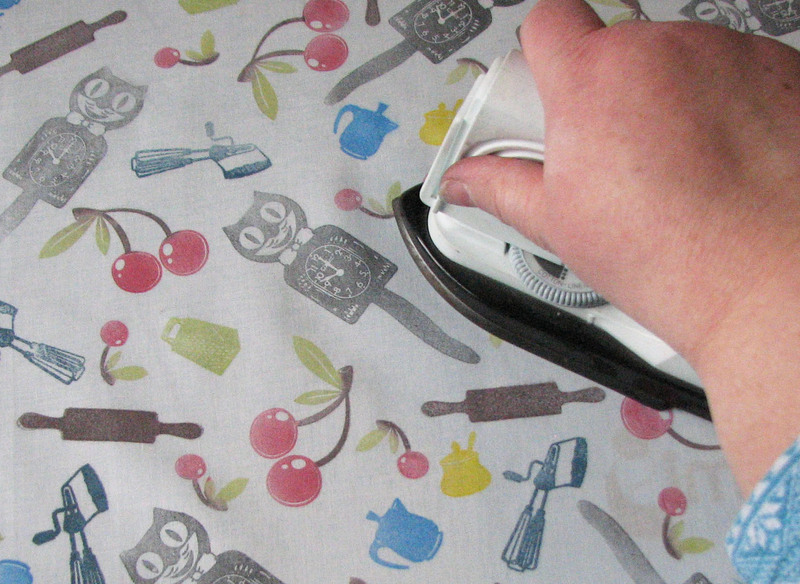 Use a scrap of fabric to form a pocket; stamp the pocket and strips of fabric for the tie with the retro design image using Teal Zeal ink; iron. 10. 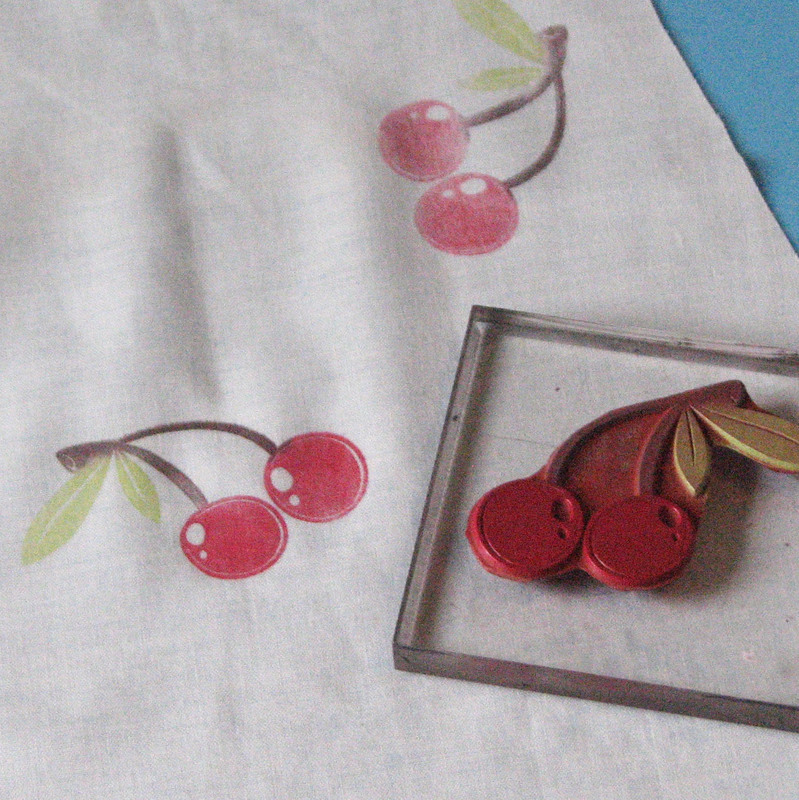 Stamp a cherry onto a canvas die-cut heart, iron; stamp sentiment over cherries and iron. 11. 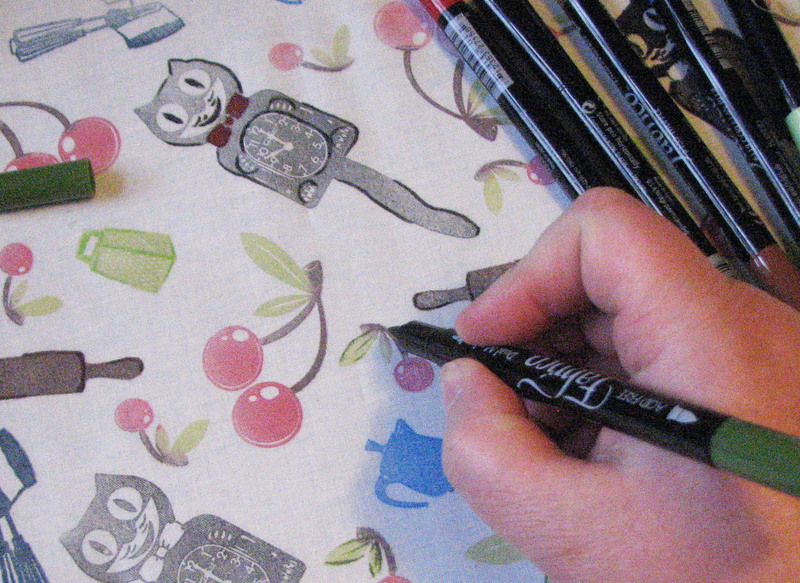 Wet the three strips of 5″ wide fabric and add a few drops of Love Letter and Rhubarb Stalk inkers. 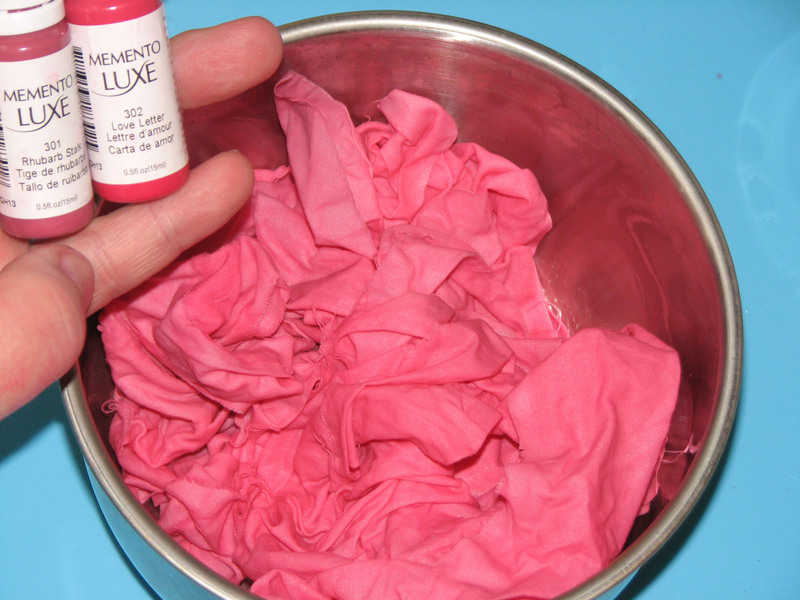 Massage the ink into the fabric until it has been completely dyed; set aside to dry. 12. 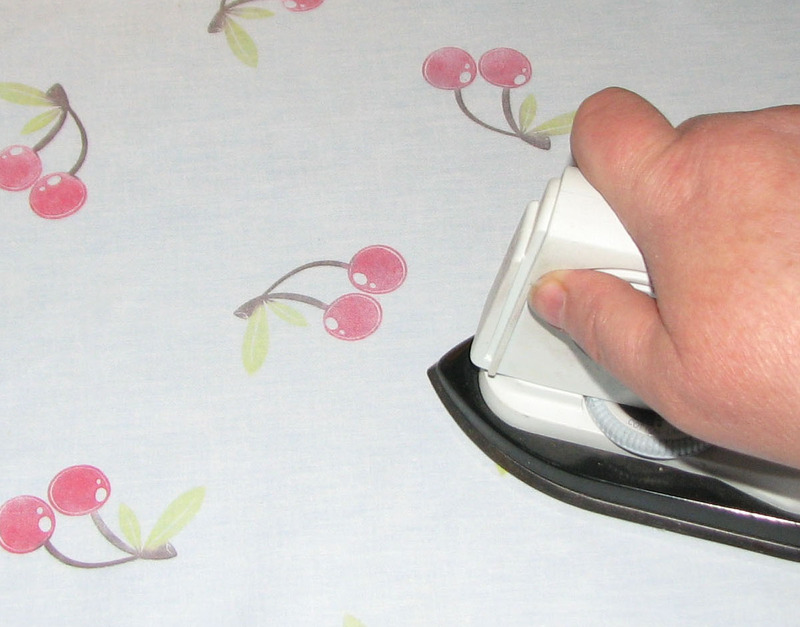 After the fabric is dry, iron to set the ink and take out any wrinkles. 13. 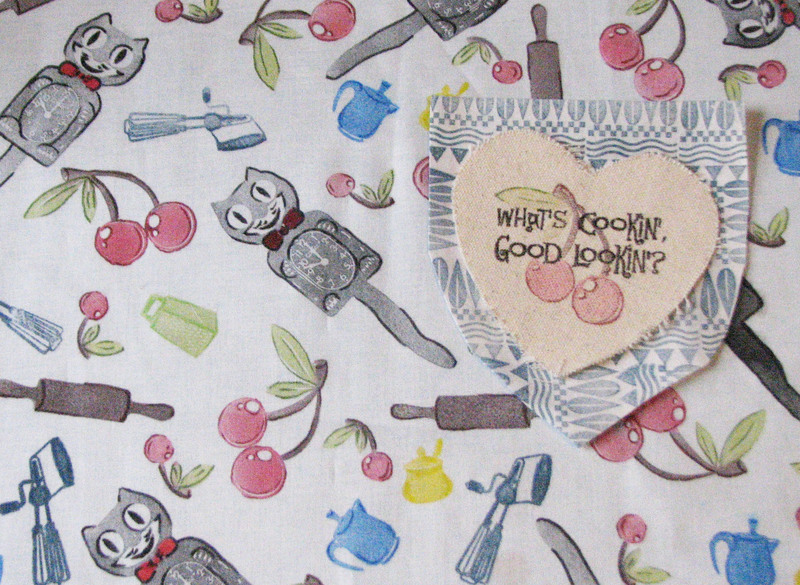 Stamp the pots and pans collage image on all three strips of fabric using Memento Luxe Love Letter ink. 14. 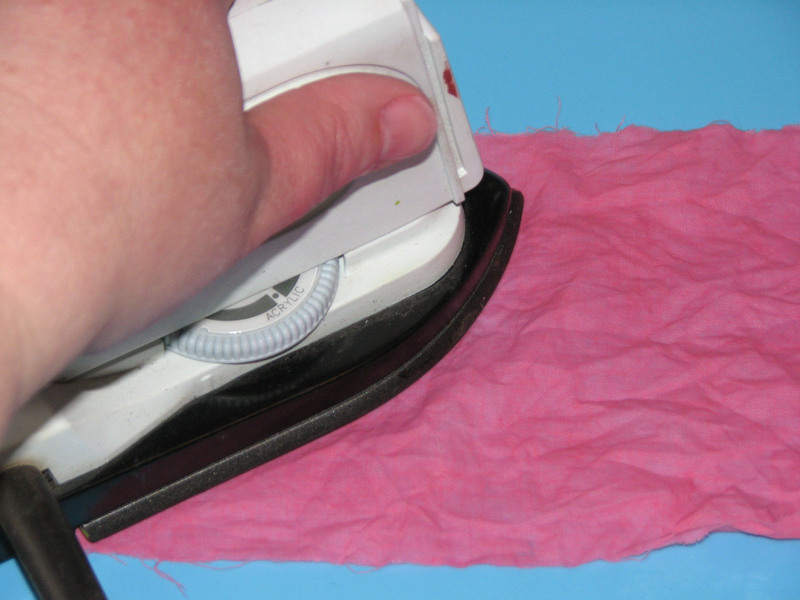 Iron to set the ink. 15. 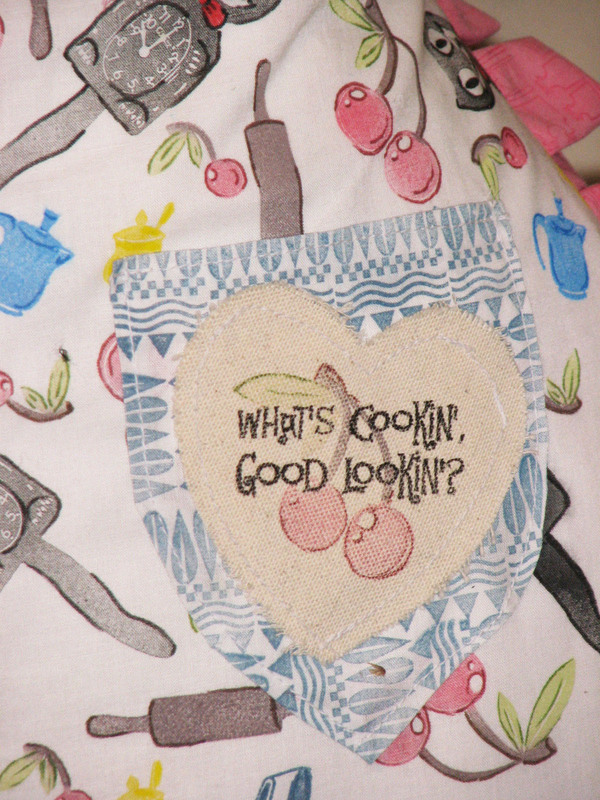 Assemble and sew the apron together.